As I read about Sears stores closing I remember the old days when you got a Sears catalog in the mail every few months. It was a big fat book with just about everything you might need: clothes, tools, household appliances,... You could order by phone if you had a Sears card or mail in an order form with a check. And the stuff would get delivered in a few days or you could go pickup the stuff at one of their centers. So I anticipate the above headline in 75 years from now. The article explains that no-one has enough money to buy much and delivery by boat over flooded streets to houses that sometime vanish between the time the order is placed and when it is delivered is too difficult and costly. Our usual household tradition is for all the people in the house to come down and over to my couch to see the tree. Then we had a nice Christmas dinner. Here is the description: "The first to welcome Sephardic exiles was the Ottoman Empire, the heart of which was in Turkey. "Shores of the Golden Horn" resounds with the blending of Jewish and Ottoman musical traditions. You will here the influence of Ottoman court music, para-liturgical maftirim, and the popular songs of the vibrant communities of Istambul, Izmir, and Edirne." And then to cap it off we went to see the Christmas Revels last night. This one had a Nordic theme. It was splendid. Brings back memories of when I was in the Revels - in 1979 and one other year as a member of the Quadrivium - an early music group. This brought up some memories of my childhood. When my parents had dinner parties we used special dinnerware, fancier silver cutlery, we had a live-in cook and a chambermaid-waitress who wore fancier uniforms than the usual ones and we dressed up. Many apartments in NYC had a small suite of maid's rooms behind the kitchen - ours had two small rooms and a bathroom. I still have some of the plates which we use when we have guests for dinner. Near the end there was a drawing for a door prize and I won. This year it was a delightlful beaver (the MIT mascot of course). Last year I also won the door prize which was a very interesting book by Charles Sullivan of the Cambridge Historical Commission and another author titled Building Old Cambridge. Sullivan was the speaker for that lunch. The beaver has joined our family. He told us his name which is Barton. He was named after William Barton Rogers, the founder of MIT. The license plate on my car - which might be 50 years old because I think it was on my 1967 Volvo 122S wouldn't pass inspection.. I checked the Massachusetts RMV several times which posts wait times for all their sites - for registration and for licenses. Once it was over an hour, at 10am it was only 4 minutes. So I drove there - 40 minutes. There were lots of people waiting in the waiting room. But I went to the greetings line and had to wait a minute; they sent me to a nearby window. I had to wait a half minute while the second clerk was logging in. I handed her my registration - she reached under the table and got a set of new plates, stuck an expires in '20 sticker on it, typed onto a computer, reached into the printer and handed me the plates and new registration form. And I didn't have to pay. Now I have to memorize it and un memorize the old one. One of the things that I do a lot is to go Contra Dancing (and English Country dancing).. 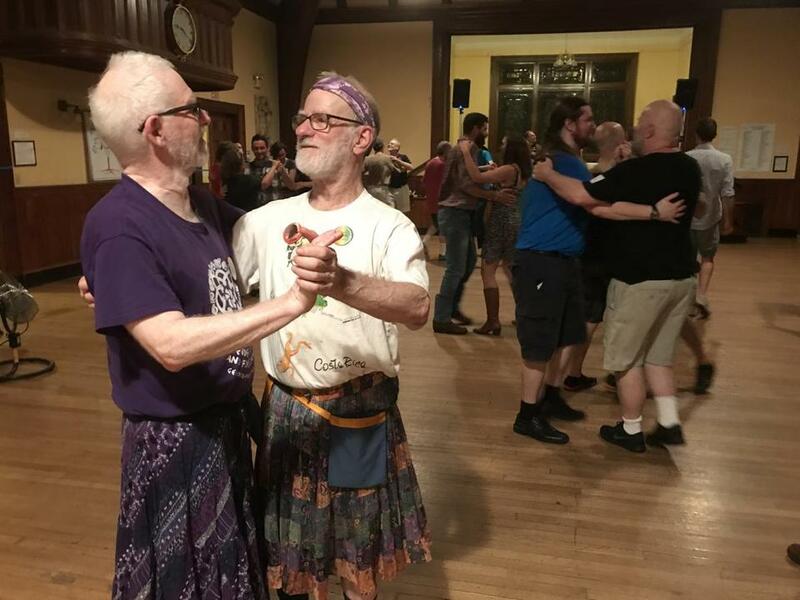 I am one of the organizaers of the Gender Free Contra Dance in Jamaica Plain (Boston). Today's Boston Globe had an article about our dance with a picrure of me and rsc. The reporter campe to our dance on July 28 and interviews quite a few people. We are getting ready to celebrate the 30th anniversary of this dance series in September.